Laboratoire Matière et Systèmes Complexes - Séminaire MSC. 1er octobre 2018. Catherine Villard (Institut Curie) : "Tip-growing cells on a chip (from neurons to fungi)". Accueil du site > Séminaires > Archives séminaires > Séminaires 2018 > Séminaire MSC. 1er octobre 2018. Catherine Villard (Institut Curie) : "Tip-growing cells on a chip (from neurons to fungi)"..
Neurons and filamentous fungi share morphological similarities associated with their invasiveness properties. In addition, they both grow by adding materials to their ends. However, their growth is based on very different biological mechanisms that we have chosen to tackle using dedicated microfluidic tools. 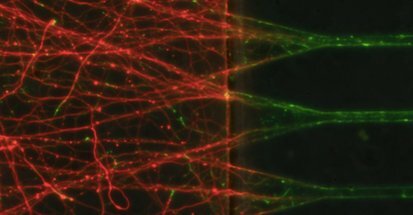 I will present some results on neuronal growth based on volume measurements, focusing on the role of propagative actin-rich structures produced in the early stages of neuronal growth. I will also present some aspects of the growth and mechanics of the opportunistic human pathogen C. albicans.